WE’VE MOVED! Visit us at our new site at http://www.hichacutting.org. Click on the championship link to the right for more information. Email us at hicha808@gmail.com if you have questions. Our next event is a jackpot show on August 20th at Anderson’s Arena in Waimea at 9:30 am. Please click on the entry blank/fees link on the right for more information. Entries are due by Sunday, August 14. There are only two jackpot shows left in the season before our annual championship in November. Our next event is our May Jackpot Cutting at Anderson’s arena on 5/21 at 9 am. Click on the entry blank, classes & fees link to the right for show information and entry which is due by May 14. MAHALO to everyone who came out to our play day at Alex’s place. Let’s put those hours of practice to good use at our next jackpot cutting. Email us at hicha808@gmail.com if you have any questions! Stay tuned for more information as our event nears. Our next event is a play day and general membership meeting at Alex Penovaroff’s place in Kamuela. Here are the details…. Who: All HICHA Members and Anyone Interested – Spread the word! Cost: $125 per horse gets you 4 gos in the herd and unlimited use of the flag. All participants must be current members for insurance purposes. We do offer a daily rate for newcomers. Lunch will be provided. General membership meeting at lunch. Please let us know by 6 pm, Sunday (4/17) evening if you intend to come out for the fun. Cattle count is due Monday. Our email is hicha808@gmail.com. Let us know if you have any questions. This is a great opportunity to school your horses and have some fun. Hope to see all of you there! MAHALO to everyone who came out to support our first two events of the season. Please click on the calendar link to the right for an updated calendar of events. HICHA is very proud to promote the “Dutch” Schuman Big Island Paniolo Scholarship Fund for high school seniors. The scholarship was created in memory of Dutch, a successful business and cowboy at heart. Dutch was a huge supporter of the horse and cattle industry on the island and was especially interested in encouraging our younger generations to pursue their interest in animal husbandry. This scholarship is a wonderful way to honor his legacy. Click on the scholarship link to the right for more information. Happy Easter and see you all in April! Happy New Year and welcome to the 2016 show season. Links to the right have been updated. Our first event is a jackpot show on February 27 and Punk Carter cutting clinic on February 28. Click on the entry link on the right for show/clinic information. Hope to see you all at the first show! The 2015 Big Island Cow Horse Championship is scheduled for November 14 & 15, 2015 at Paniolo Park at Parker Ranch in Kamuela, Hawaiʻi. The excitement gets started on both days at 9 am. Come and cheer on our riders as they compete in the snaffle bit futurity and maturity, super horse, bridle horse, 2 year old in training, cutting and reining events. 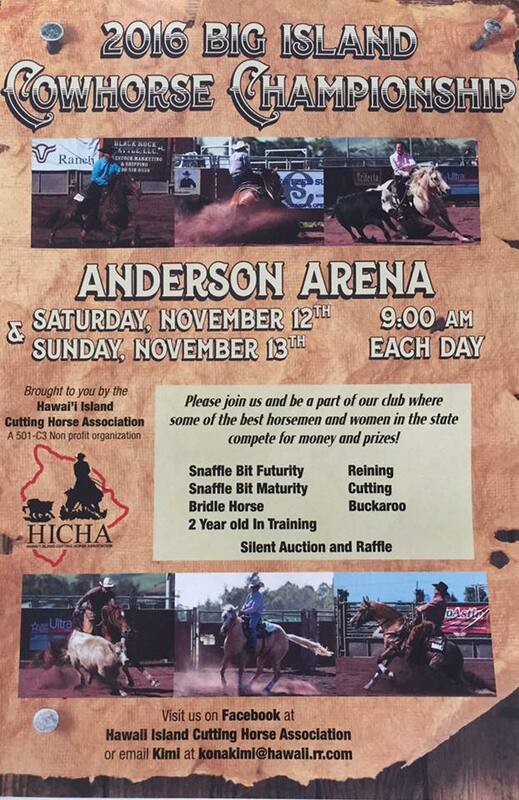 For more information, click on the Big Island Cow Horse Championship link to the right. Due to cattle availability, this Saturdayʻs show will take place at Hale Kea in Waimea and not at Honokaʻa as originally posted. So far, we have a good number of participants and are looking forward to a great day together. Our judge for the day is Skip Schuman from Oʻahu. We are excited to announce a special year end youth award offered by Kerry Schuman in honor of her beloved horse “Lady Smoker” who passed away on February 10th of this year. The year end award will go to the youth with the highest combined score for youth cutting, youth reining and youth limited. 1st place will received $300 and 2nd will receive $200. See any one of our board members for more information. Hope to see yaʻll at the show! MAHALO to everyone who came out for the fun at our first play day. 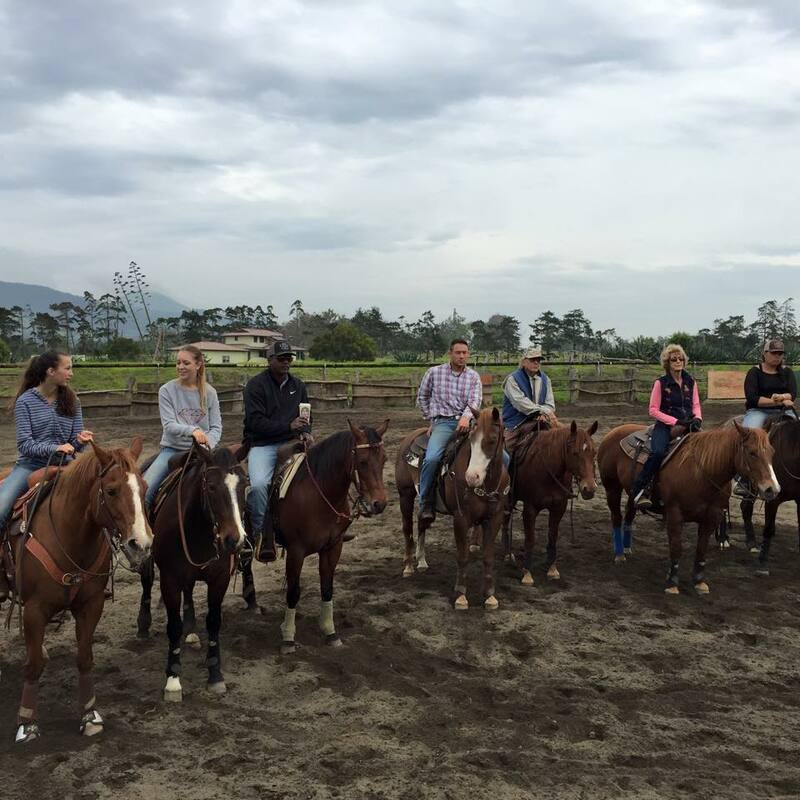 We had some new faces and horses and everyone had a good time. Our first jackpot show is Saturday, March 14, 2015 at Honokaʻa arena. Please click on the show entry link to the right for entry information. If youʻd like to get in touch with our club, please email us at hicha808@gmail.com and weʻll get back to you ASAP. You can also visit us on our Facebook page by clicking here. MAHALO for stopping in! Welcome to the Hawaiʻi Island Cutting Horse Associationʻs blog. We have a great board who is committed to planning a fun year for all of our members. Our first event will be a Play Day and General Membership Meeting on Saturday, February 28 at the Penovaroff Ranch in Waimea. We encourage old and new members to join in the fun! Bring a friend. We promise fresh cattle, the flag to practice on, fellowship and fun.